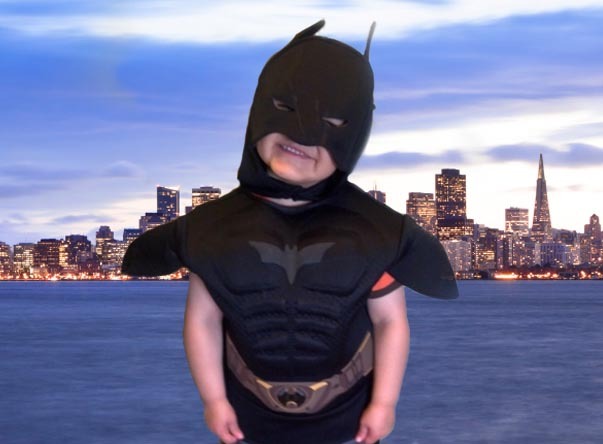 Make-A-Wish Greater Bay Area on Friday turned San Francisco into Gotham City to provide 5-year-old leukaemia sufferer Miles Scott the experience of a lifetime. 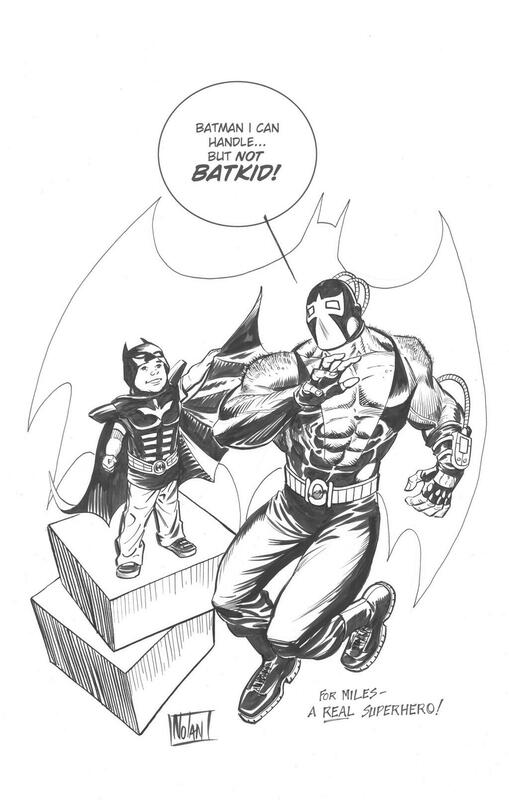 Thousands of volunteers, local business and organisations worked together to make it possible for him to realise his wish to be Batkid for a day. Miles’ day began at 10 a.m. with a call for help from police chief Greg Suhr. Batman appeared in a Lamborghini Batmobile to ferry the young crime fighter across the city, rescuing a damsel in distress on the cable car line, foiling The Riddler’s bank robbery near the Financial District, and chasing the Penguin and his cronies to a climactic battle of good vs. evil at AT&T Park, to rescue San Francisco Giants mascot Lou Seal. 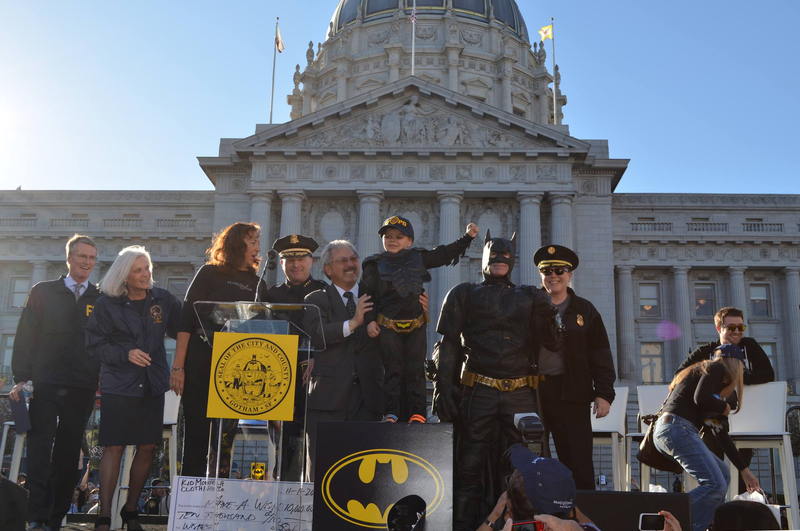 The day ended with a celebration ceremony at City Hall where San Francisco’s mayor Ed Lee gave Miles a key to the city and declared November 15 Batkid Day Forever. Miles Scott, from Siskiyou County, was diagnosed with lymphoblastic leukemia at 20 months of age and has gone through three years of chemotherapy. Now in remission, Miles has started attending kindergarten. Miles told the Make-A-Wish Foundation that the dream of his young life was to be a superhero for one day, helping those in danger and fighting villains. Batman artist Graham Nolan drew him into a piece of original art, posted on his Twitter channel. 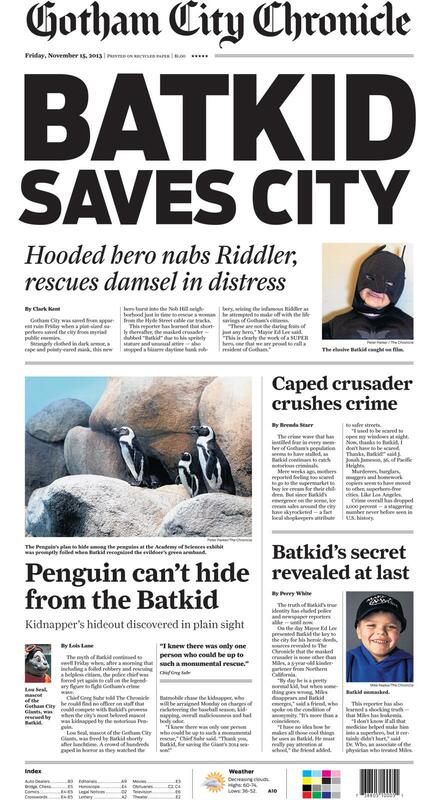 The San Francisco Chronicle dedicated its Friday front page to the superhero with the headline, “Batkid Saves City”. President Barack Obama cheered Batkid on via Vine. Mayor Lee, Police Chief Greg Suhr & Fire Chief Joanne Hayes-White with U.S. Attorney Melinda Haag & FBI Special Agent in Charge David Johnson join Make-A-Wish Greater Bay Area to celebrate Miles aka “BatKid” for his crime fighting and saving Gotham City. The US Department of Justice posted a press release announcing that Edward “E.” Nigma, aka, “The Riddler,” and Oswald Chesterfield Cobblepot, aka, “The Penguin” had been formally arrested charged with multiple counts of conspiracy and kidnapping for their all too familiar villainous ways in Gotham City. 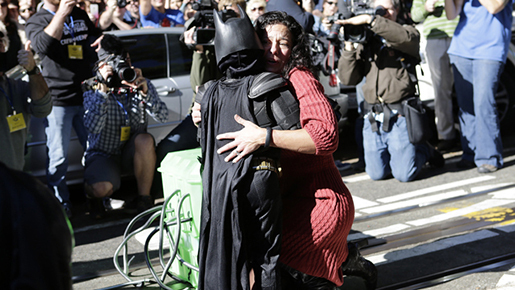 Batkid Photo Project, A Facebook Community, has invited San Francisco residents and visitors to post photos of the day. See the Bay Area Make A Wish Twitter page for photos from the day.